“All Together Now”, the documentary about the making of the Beatles and Cirque du Soleil’s “The Beatles: LOVE”, has been nominated for a Grammy Award in the Long Form Music Video category (Adrian Wills, video director; Martin Bolduc & Jonathan Clyde, video producers). “All Together Now” details the story behind the unique partnership between The Beatles and Cirque du Soleil that resulted in the creation and 2006 launch of “LOVE”, the stage production still playing to packed houses at The Mirage in Las Vegas. The film also documents the creation of the show’s music, the experimental Beatles soundscape album of the same name which garnered two Grammy Awards for producers Sir George Martin and Giles Martin in the categories of Compilation Soundtrack Album for Motion Picture, Television or other Visual Medium and Surround Sound Album. You can see two short trailers from “All Together Now” here. The 52nd Annual Grammies will be presented Sunday, January 31, 2010 in Los Angeles. 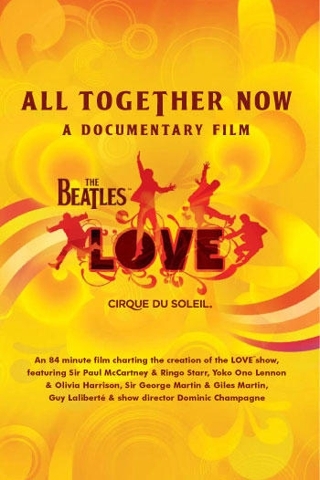 “All Together Now” is a feature-Length documentary chronicles the making of “The Beatles’ LOVE” by Cirque du Soleil. The film details the story behind the unique partnership between The Beatles and Cirque du Soleil that resulted in the creation and launch of “LOVE” and the double Grammy-winning album of the same name. The film is dedicated to the memory of Neil Aspinall, an Executive Producer. “All Together Now” faithfully recounts how the “LOVE” project came into being, borne from the personal friendship between George Harrison and Cirque du Soleil founder Guy Laliberte. George saw how the twin talents of Cirque’s artistry and The Beatles’ music could be fused into something new and totally original. The director, Adrian Wills, records early meetings between the Cirque & Apple Corps Ltd. creative teams, as well as contributions from Sir Paul McCartney, Ringo Starr, Yoko Ono Lennon and Olivia Harrison discussing how The Beatles’ music can be used in a different way. We hear about the decision to utilize the combined talents of Sir George Martin and his son Giles Martin to produce what became a 90-minute soundscape created from The Beatles’ multi-track recordings and how this new audio adventure was being quietly worked on in the famous Abbey Road Studios in London, England whilst the first creative ideas for the show were being formulated in Montreal, Canada. These early stages of the project were all filmed, as were the first rehearsals at the Mirage Hotel theatre in Las Vegas, which was completely rebuilt with a one-of-a-kind sound system and complex round staging to house the “LOVE” show. George and Giles Martin, the show’s Musical Directors, were involved every step of the way with the remarkable Cirque du Soleil creative team, performers and backroom staff. It wasn’t all “plain-sailing” and there has been no attempt to disguise some of the disagreements that took place along the way regarding how some of the songs would be portrayed visually. These creative differences, a necessary part of the overall process of bringing “LOVE” to its most vibrant life, illustrate the participants’ love and respect for the music and vision of The Beatles. The “All Together Now” documentary provides fascinating insight into the creative skills and passion that went into making this project a groundbreaking critical and commercial success. This entry was posted in Beatles, Beatles Collecting, Beatles Music, Beatles Related, Beatles related DVD and tagged All Together Now, Beatles, Beatles Collecting, Beatles Related, Cirque du Soleil, George Harrison, George Martin, John Lennon, Music, Paul McCartney, The Beatles Love by beatlesblogger. Bookmark the permalink.